Growing up in Hawaii, I was exposed to a lot of local Japanese culture. But it wasn’t until I met Annie that I was introduced to Japanese tea culture. We were privileged to attend a Japanese tea ceremony demonstration held at the Japanese Tea Garden on the grounds of the East West Center at the University of Hawaii. It was quite an experience, one that I will not forget. Coming from a British-influenced country like Malaysia, Annie loves to drink tea. 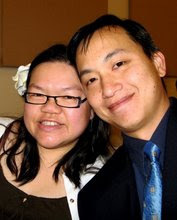 She was so happy when a Lupicia tea store opened up in the Valley Fair mall in San Jose. They have such really wonderful teas there, and sometimes you can find good deals on clearance items. 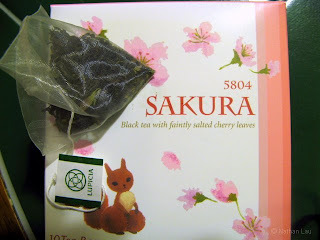 Such as this sakura tea – a black tea flavored with lightly salted and cured cherry leaves. Of course, now you have to have something to go with the tea. What better finger food to enjoy with sakura tea, than sakura mochi? 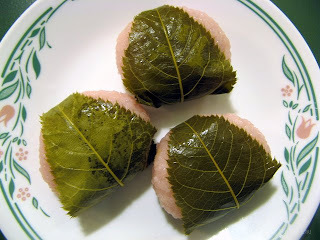 The soft, sweet, glutinous rice paste is filled with sweet azuki bean paste, then wrapped in a slightly salty cherry leaf that adds a faint “green” flavor and a pleasing bite to the texture profile. Nibble, sip. Nibble, sip. Let the flavors meld in your mouth…mmmmm…..perfect! What are your favorite tea / finger food combinations? In a previous post we did gyoza which was cooked by thrice boiling it in a big pot of water. The boiled dumplings are then eaten with a soy-vinegar dipping sauce or enjoyed with a steaming bowl of noodles. That’s not the only way to eat gyozas though – you can pan-fry them as well. Put a little oil in a med-hot pan, arrange some gyoza flat-side down and start frying until you hear a sizzle. Then add some water to the pan until it comes up to 1/3 of the height of the gyoza. Cover the pan and cook until the water has evaporated. Let the gyoza crisp up for another minute, then remove from heat. You can either scoop them out with a spatula (be careful not to break the skins) or turn them over onto a plate. I like eating pan fried gyoza because the flavor is not lost in boiling water. 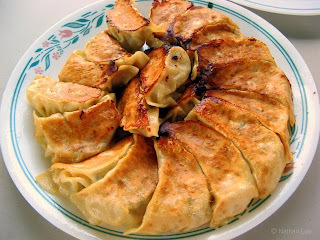 Instead, flavor is created from concentrated, caramelizing gyoza juices. You don’t need any dipping sauce this way. What’s your favorite way to eat gyoza? Fall is the season for harvesting sweet potatoes. I’m not just talking about the yellow and the orange sweet potatoes you normally see showing up in pies and casseroles. 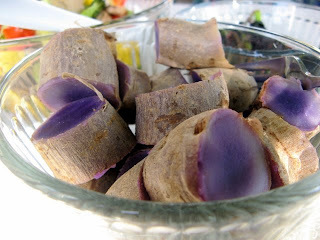 There is also the Okinawan sweet potato, which is purple like a yam but has almost none of that stringy fiber or gritty mouthfeel. We picked up these Okinawan sweet potatoes for a good price, about a doller per pound at the Asian grocery these days. Just wrap in foil and bake until cooked through. I love the amazing purple color and the delicate, sweet flavor. There is nothing that can compare. You can eat them plain like this or mash them up to make haupia sweet potato pie or use them as a filling for spiral pastries (that’s another post). Have you had these beautiful and delicious sweet potatoes before? Try them! A lot of times when we go out to dim sum, we order the cheong fun – steamed rice noodles filled with either shrimp or char siu. It’s just one of those things we have to have, because you can’t normally find fresh steamed noodles in the Asian groceries. The ones that are sold in the Asian groceries tend to be cold and hard and not as nice to eat. Recently we found out that King Eggroll on Story Rd near McLaughlin in San Jose sells fresh steamed cheong fun. We bought a couple packets home, and they were quite soft! Cut the rolls up into chunks, then tossed them in a sauce consisting of hoi sin, soy sauce, dark soy sauce, water, and sesame oil. 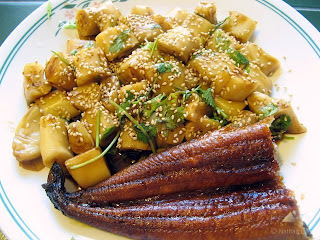 Garnished with cilantro (didn’t have green onions) and sesame seeds. We brought out a frozen unagi from the freezer and reheated it in the microwave to serve alongside the noodles. What would *you* do with noodles like these? SWIFT Theme by Satish Gandham. 51 queries in 0.985 seconds.